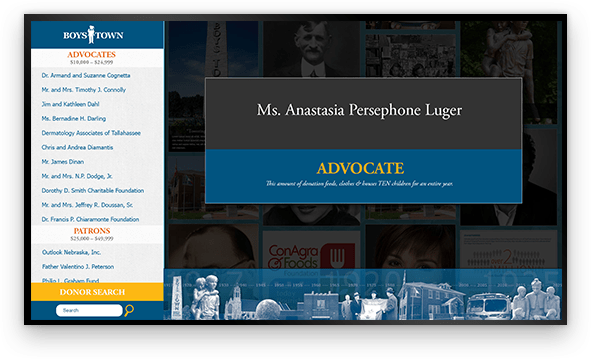 Creating unique digital experiences designed to recognize, engage, and inspire donors. Digital donor experiences allow you to share more detailed information about your donors. Sharing why people give to your organization is the best way to help motivate future donors. Showcasing your cause and the effect it has on the community is key to help drive new donations. Seeing the recognition a donation receives inspires others to give. Potential donors will feel encouraged seeing the recognition and get them excited to have their own stories heard. Our award-winning software makes it easy to keep donor displays fresh, relevant, and always up-to-date.